<*}}}}}}}}}>< — Another interesting list of local fish was seen in a newspaper editorial in 1969. Editor: Some of your readers may be interested in learning of the different species of fish that inhabit south San Francisco Bay. The state Department of Fish and Game issued a report based on sample collections of fish caught in the Bay during the years from 1953 through 1966. 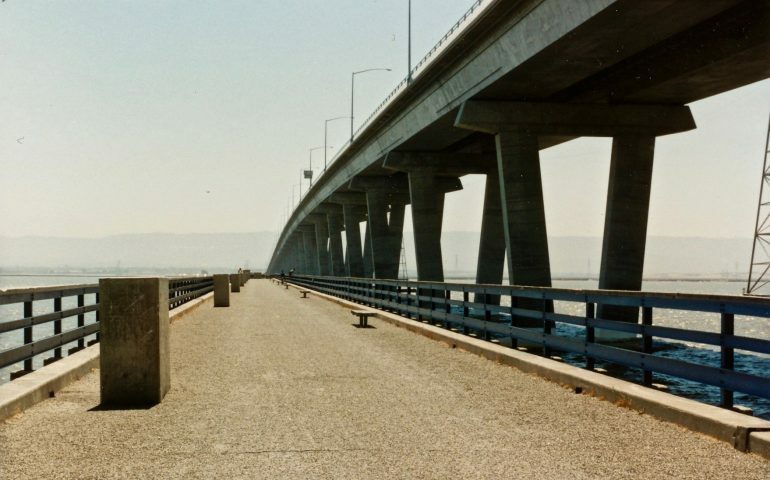 The report states that the following fish were caught in the vicinity of the Dumbarton Bridge: anchovy, striped bass, croaker, flounder, goby, herring, lamprey, midshipman, perch (no rubberlip perch however), pipefish, ray, rockfish, sanddab, sculpin, shad, shark (brown smoothhound, leopard, sevengill and spiny dogfish), skate, smelt, sole, stickleback, tomcod and tonguefish. The four most common fish caught in 1966, in order of size of catch, were the anchovy, perch, smelt and herring. The report notes, “On April 24, 1964, feeding schools of anchovies south of the Dumbarton Bridge were estimated to contain several tons of fish. Several times an anchovy haul was over 1,000 pounds, and could not be hauled aboard the trawler. It was also noted that a small run of steelhead passes through this area to San Francisquito Creek in Palo Alto, and also, in each of the four years this area produced more fish than the Bay opposite Oakland Airport and south of the San Mateo Bridge. 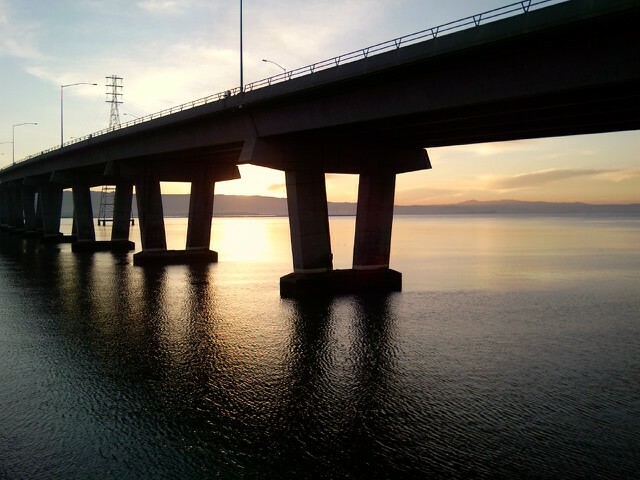 A perch closure exits in San Francisco and San Pablo Bay from April 1 to July 31. No perch may be kept other than shinerperch (20). In San Francisco and San Pablo Bay a fishing line may not contain more than three hooks. A sturgeon report card and tags are required for anyone fishing for or taking sturgeon. (a) The card must be in the angler’s possession; (b) a tag must be used for any sturgeon retained by the angler; (c) the angler must record information on the Sturgeon Report Card immediately after catching and keeping or releasing the sturgeon. White sturgeon can only be kept from 40-60 inches; larger and smaller sturgeon must be released. Green sturgeon may not be taken or possessed. History Note. This area has an interesting history. The name Dumbarton Point itself apparently dates to 1876 when it was named after the town Dumbarton, Scotland. About the same time, Origin Mowry established a successful landing on the deep slough just south of Dumbarton Point. Railroads also played a part in the growth of the area when the narrow-gauge Santa Clara Valley Railroad was bought by James Fair, James Flood and Alfred “Hog” Davis. They renamed the line the South Pacific Coast Railroad, extended the railroad from Dumbarton Point to Santa Cruz, and eventually offered daily commute service north to the Alameda Pier. In addition, people could catch the railroad’s ferryNewark, which ran daily trips from Dumbarton Point to San Francisco. Eventually that railroad was bought by Southern Pacific and this area became one of the busiest freight junctions in California. Built by private funds (the Dumbarton Bridge Company), the bridge was partially rebuilt in the 1940s to deal with increased traffic. In 1951 the state bought the bridge for$2.26 million dollars. Hours: Open daily from 6 a.m. to 8:30 p.m. except for Thanksgiving, Christmas and New Years. The road to the pier is closed from April 1 to August 31 but a free shuttle runs from the Visitor Center to the pier at 9 a.m. and 12:30 p.m. The shuttle picks up returning anglers at 12:45 and 5:15. Reservations for the shuttle are advised (510-792-4275).